SQLite is a file based and transactional database engine. Because of it’s lightweight capabilities, SQLite’s adoption has increased in the recent past. You can know more about it here. Below is an example of Tornado’s interaction with SQLite DB. 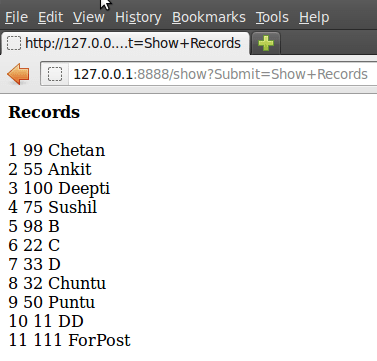 Step 3: Clicking on ‘Show Records’ shows all the records user has added to ‘stud’ table. Chetan, do you know say if the sqlite will block the tornado ioLoop?